Narita International Airport, Japan’s predominant international airport, has become the first airport in Japan to receive duty-free shops in the area where travelers take their first steps into the country. Two shops managed by the NAA Retailing Corporation will begin business in the immediate arrival area on the second floor of the main building of Terminal 2, even before travelers reach the medical inspection/quarantine area or pass through immigration. Fa-So-La Arrival Duty Free North opened on September 1, 2017, while Fa-So-La Arrival Duty Free South follows suit on September 4. The merchandise of both shops will be limited to imported liquors and tobacco products. Not flying into Narita’s Terminal 2? No worries, because the arrival areas of Terminals 1 and 3 will also be receiving duty-free shops by the end of the year. One shop each is planned to open on the first floor of Terminal 1’s North Wing and South Wing respectively, while Terminal 3’s lone shop is planned for the first floor of the terminal’s main building. 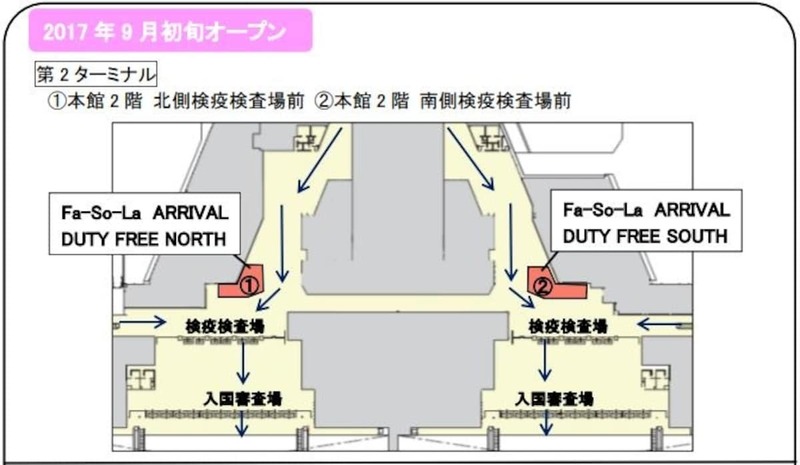 Hopefully the new duty-free shopping areas will cut back on a bit of the carry-on luggage that passengers purchase prior to boarding any Japan-bound flights.